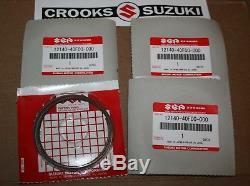 NOS 12140-40F00 Genuine Suzuki GSX-R1000 Piston Ring Sets (4 Sets, enough for one bike). 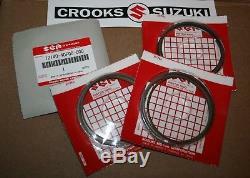 New Old Stock Genuine Suzuki 12140-40F00 GSX-R1000 Piston Ring Set (4 Sets, enough for one bike) Please note this item is New Old Stock and still in its Suzuki packaging, check photos for condition. Fits: 2001 GSX-R1000K1, 2002 GSX-R1000K2, 2003 GSX-R1000K3 and 2004 GSX-R1000K4. Please note this special offer price is only valid while stock is available. Crooks Motorcyles Ltd t/a Crooks Suzuki, 36-44 Crellin Street, Barrow-in-Furness, Cumbria, LA14 1DY, UK. The item "NOS 12140-40F00 Genuine Suzuki GSX-R1000 Piston Ring Sets 4 Sets, enough for on" is in sale since Monday, July 9, 2018. This item is in the category "Vehicle Parts & Accessories\Motorcycle Parts\Engines & Engine Parts\Pistons, Rings & Pistons Kits". The seller is "crookssuzuki" and is located in Cumbria. This item can be shipped worldwide.